Basic Political Writings, trans. Donald A. Cress. Indianapolis: Hackett Publishing, ᱑᱙᱘᱗. The Confessions, trans. Angela Scholar. Oxford: Oxford University Press, ᱒᱐᱐᱐. Emile, or On Education, trans. with an introd. by Allan Bloom, New York: Basic Books, ᱑᱙᱗᱙. "On the Origin of Language", trans. John H. Moran. In On the Origin of Language: Two Essays. Chicago: University of Chicago Press, ᱑᱙᱘᱖. Reveries of a Solitary Walker, trans. Peter France. London: Penguin Books, ᱑᱙᱘᱐. 'The Discourses' and Other Early Political Writings, trans. Victor Gourevitch. Cambridge: Cambridge University Press, ᱑᱙᱙᱗. 'The Social Contract, trans. Maurice Cranston. Penguin: Penguin Classics Various Editions, ᱑᱙᱖᱘–᱒᱐᱐᱗. 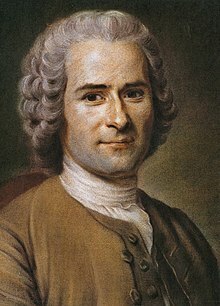 The Political writings of Jean-Jacques Rousseau, edited from the original MCS and authentic editions with introduction and notes by C.E.Vaughan, Blackwell, Oxford, ᱑᱙᱖᱒. (In French but the introduction and notes are in English).